As the dust settles (or not) after the General Election, the wider impact on the energy sector is unclear, however one initiative continues on despite increasing calls for a re-think: smart meters. I have previously written about the technological shortcomings of the project – these continue – but other problems are becoming apparent, particularly in relation to the timescales for the deployment. Utility Week has recently reported that a lack of skilled installers is leading to safety fears, while the Telegraph suggests that energy companies, already facing calls for energy price caps could face fines if they fail to install enough meters. Although the smart meter programme is voluntary for consumers, energy companies have already been fined for failing to meet their installation targets. The shortage of skilled installers was described in more detail in Engineering & Technology Magazine published by the Institute of Engineering & Technology, which reports that while there are currently around 7,500 certified installers currently employed in the roll-out, with plans to train around 6,000 more by April 2018. Installers are apparently being offered £250 for referrals of friends and colleagues, although there are suggestions that low pay rates and a complicated installation process make the job unattractive as a career choice. It is also suggested that the way in which the rollout is being managed may be contributing to the issues – elsewhere in the EU, smart meters are being installed by power distribution companies rather than energy supply companies, who generally employ teams of electrical engineers for the installation and maintenance of network infrastructure. Had DNOs been responsible for the rollout, each DNO would have installed the same type of meter in its coverage area, avoiding many of the current issues with first generation smart meters which are not compatible with the systems of other suppliers, meaning that the meters revert to being “dumb” if the user switches energy supplier. According to Utility Week, around 5 million smart meters have already been installed, although most of these are first generation (SMETS 1) meters with limited functionality. There have been recent press reports that many of these meters will need to be replaced, potentially at an additional cost of £100 per unit, as they will not be capable of being adopted into the infrastructure developed by the Data Communications Company (DCC), although the government disputes this. SMETS 2 meters should be have the full range of functionality, but so far these are still in the testing phase. Suppliers are reported as being unwilling to deploy these next-generation meters until the testing is fully complete and any issues resolved. Even if the 5 million SMETS 1 smart meters are not replaced, the goal of installing 53 million smart meters by the end of 2020 is almost certainly unachievable. Last year the Department for Business, Energy & Industrial Strategy reviewed the UK smart meters programme and found that the benefits are likely to be much smaller than previously thought – at £11 per household by 2020 as opposed to £26 per household. The question of cost is a sensitive one. In the UK, the £11 billion costs of the smart meters programme are being recovered through consumers through their bills. In May 2017, Harris Interactive, a research organisation, carried out a survey of the smart meter rollout on behalf of Utility Week. 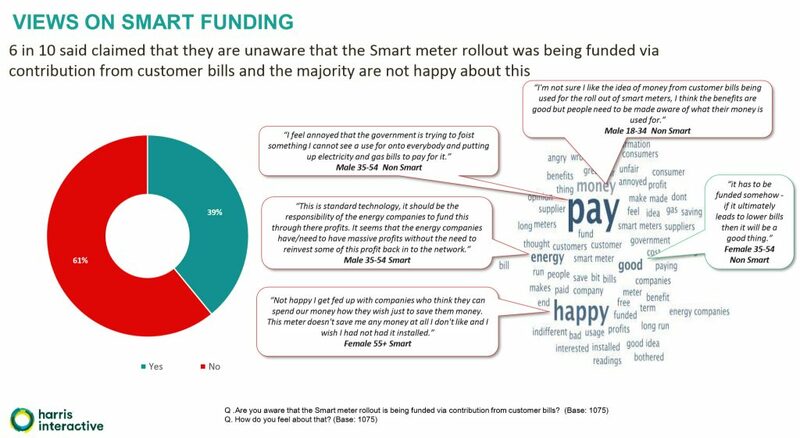 The survey found that over 60% of respondents were not aware that the costs of the programme were being recovered through energy bills, and the reactions to being told this were “extremely negative”. The Institute of Directors recently renewed its calls for the smart meter programme to be put on hold, claiming that an urgent review is needed to re-assess the costs and benefits, particularly as the objectives of smart meters can be achieved more cheaply than via the current scheme. It’s hard not to agree with this conclusion. It’s time to pull the plug on this expensive white elephant and re-evaluate whether the realistically achievable benefits from a smart meter programme are worth the cost and effort of progressing with their installation at all, or whether the whole idea should be shelved until smart home technology becomes more ubiquitous, and more tangible benefits emerge. It implies that someone actually thought about it in the first place. I guess that the people in the” Dominican Republic”, had the right idea. As a people they pulled together and removed them from their homes only to be placed in one big pile for Hydro to collect. them. It’s amazing how there is proof, that power is with the public and not the “Corporations”. Please check under “Dominican Republic”, pulled the plug on smart meters. Luckily in the UK we can refuse to have them installed…removing them yourself (even if you found an engineer to do it) would cause all sorts of problems best avoided. That’s right, they are not mandatory in the UK, and typically only SMETS-1 meters are available which stop being smart if you swtich supplier.